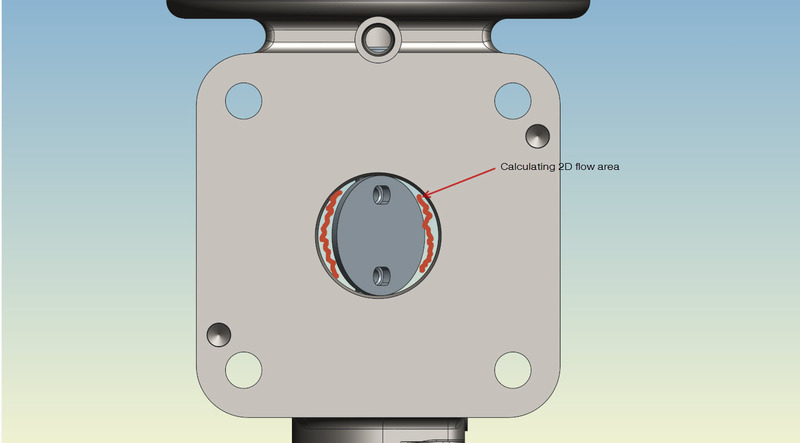 I am trying calculate the flow area in a butterfly valve and am having some issues trying to quickly grab area measurements. Currently, I open the valve x amount of degrees, then sketch the profile of the angled butterfly plate, fill it, then measure the area of that filled sketch. It works pretty well but it is VERY time consuming. I have also tried to use the shadow analysis tool but it isn't quite accurate enough for what I need. Is there a better way??? How about creating a surface on a plane using the edges then measure the area of the surface. Thanks for your comment, I have basically been doing just as you suggested. When I have simple geometry I have no problem with that as I open the valve plate. The big problem I have is when the profile of screws that hold the butterfly to the shaft become involved. I am having a hard time trying to link a sketch or edge to a screw head at an angle, for some reason creo won't pick up on those surfaces.